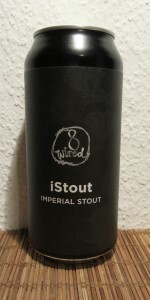 iStout | 8 Wired Brewing Co. If you’re feeling politically incorrect try it with your favourite cigar, or a dram of your best single malt whisky. Or, if your tooth is sweeter, why not jump in at the deep end with the most decadent dessert of all; half a bottle in a glass with a generous scoop of vanilla ice cream on top (beer geeks like us know it as the Imperial Stout Float). Or simply enjoy it on its own as a decadent dessert or night cap - the perfect winter warmer! If you don’t already know the history of Russian Imperial Stouts please check it out on the internet, it’s a good story. But remember, although based on that century-old classic style, this beer is a very modern interpretation, like all our beers! Very dark appearance with minimal head. Aroma is a pleasant chocolate with a touch of coffee. Taste is also a pleasant chocolate with a touch of coffee. L: Jet black color, quarter finger brown head, nice lacing, no visible carbonation. S: Chocolate, coffee. Plain and simple. T: Roasted coffee, chocolate, bittersweet. A "raw" imperial stout without gimmicks. F: Full bodied, thick like engine oil. Not smooth and silky though. O: This beer brought me back to the definition of an imperial stout. It was nice to go back to the roots. This tastes like no stout we’ve had before. Worth trying once but wouldn’t repeat. Definitely hoppy edge as the label denotes. Reminds me of a strong rind cheese with a complex balance of bitter and sweet. Did not pick up coffee as strongly as others. Poured into a snifter, the appearance was a semi-thick black color with a small eggshell white foamy head drifting off subtly. Lace spider webbed very nicely. The aroma started off with a blend of dark chocolate, milk chocolate, dark fruits, black licorice, light coca cola and a sweet earthy semi-sticky note. The flavor had a sticky sweet note meshing the prior mentioned aromas together. Superb roasty coffee and bittersweet dark chocolate nibs biting in on the aftertaste. The mouthfeel was about medium bodied with fine sipping quality. Appropriate dryness hinges with an expected ABV delivering a cohesive dry and roasty semi-bitter harsh quality on my tongue. Finish was sticky with a refined grip of roastiness. Overall, very nice Russian imperial stout pulling in a lot of the normal European qualities I was expecting. Definitely one to come back to this Winter. Pours black with a short lived head of tan foam, near zero lacing. Nearly equal portions of dark chocolate, roasted malt and coffee in the nose. Some alcohol. Roasted malt, coffee, bitter chocolate flavours, again, some sweet notes here and there. Kinda boozy; some in the taste but mostly after each swallow. Quite warming. Really tasty however unless you drink this quick, the warmer it gets the more boozy it gets. Still really nice, dark chocolate and coffee. Cheers. This is a magnificent beer with a BIG hit of all you need from a stout with knobs on. The blackness that hits you on pouring is surpassed by a by the temptation of a creamy head, coffee-like in colour and swift to disperse. The nose is welcoming with a pleasing balance of melting chocolate, espresso and some pine notes. The taste is wonderful with a superb balance of sweet and bitter notes combining to make a beautiful beer. It is not too cloying for a strong beer due to the wise use of hops and I would recommend to all. Pitch black color with mocha head. Aroma has dark fruits and some astringent roasted malt notes. Taste has milk chocolate, caramel, toasted malt, some coffee bitterness on the finish, really well balanced overall. Medium to full bodied, smooth mouthfeel. Really well made, easy drinking imperial stout. Now we're talking! Could it be the best Aussie/NZ imperial stout? Just so smooth. No alcohol heat, creamy mouthfeel, biscuit and caramel malt and - this is what makes it such a stunner - tropical fruit hops, singing a beautiful top note over a sonorous malt choir. Do I have one complaint? "iStout". If I wanted a brew made by Apple I'd buy a cider! iStout from 8 Wired Brewing Co.